Sri Lanka, primarily an agricultural nation, marks a significant milestone today (July 23) when the waters of the last but largest reservoir of multipurpose Mahaweli Project at Kalu Ganga will receive waters from the river to irrigate parched dry lands in the Rajarata, Wayamba, Central and Eastern Provinces on one hand and faraway Vanni in the Northern Province on the other. Water filling of the Kalu Ganga – Moragahakanda reservoir, which is six times larger than the gigantic Parakrama Samudraya, constructed centuries ago by King Parakramabahu the Great to make our country self sufficient in rice, takes place today with the participation of President Maithripala Sirisena. This also marks completion of the Mahaweli Multipurpose Project of which the first project at Polgolla in the Central Province by the then Prime Minister Sirimavo Bandaranaike on January 8, 1976. Indeed, Mahaweli is truly the biggest multipurpose national project, which was implemented by different governments during the last four decades. The project first planned and feasibility studies were done by the governments of Dudley Senanayake and S.W.R.D. Bandaranaike, was initiated by Mrs Bandaranaike in 1976 at Polgolla. However, the bulk of the work was done during the J.R.Jayewardene period, during which the 30-year project was speeded up to be completed in five years under the able leadership of Minister Gamini Dissanayake. 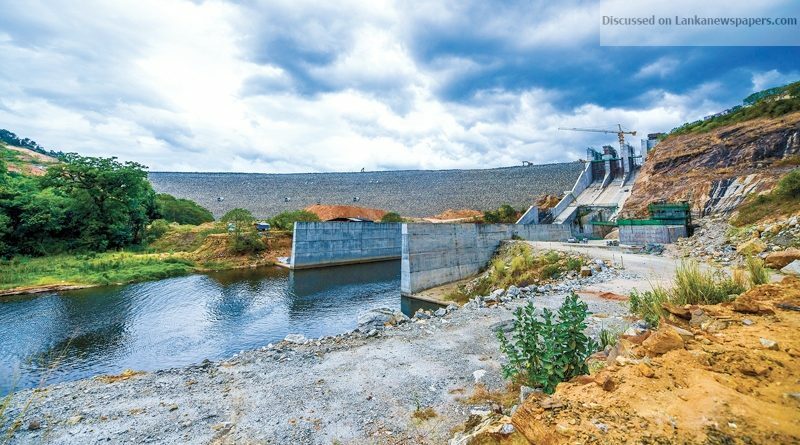 Although the bulk of the work was done during the UNP regime under the accelerated Mahaweli programme, the last phase-that of the Kalu Ganga-Moragahakanda project was considerably delayed due to various reasons. Maithripala Srisena, watched these developments first as a youth belonging to a Mahaweli farmer family and later as a novice Member of Parliament representing Polonnaruwa, the cradle of rice farming. Much later in 2007, he succeeded in obtaining the government approval and initiated the Kalu Ganga-Moragahakanda project, which was a dream vision of his. Immediately thereafter, he ran into difficulties starting with non availability of funds. Undeterred, he continued his struggle and finally he could take effective steps to accelerate the project when he became the Executive President three and a half years ago. Today, water filling of the Kalu Ganga reservoir will commence at the Kalu Ganga Dam, which is a large gravity dam, and the second vital component of the Kalu Ganga Moragahakanda Project that was constructed at a cost of Rs. 2,300 million, which is almost three times the entire cost of the previous projects of the accelerated Mahaweli Multipurpose Project. The capacity of Kalu Ganga reservoir is 265 million cubic meters and will divert 100 million cubic meters a year to the Moragahakanda Reservoir. The reservoir will irrigate 3,000 hectares in the Kaluganga basin. Water from both, the Moragahakanda and Kalu Ganga reservoirs, will be primarily used to support agricultural needs to an area of at least 81,422 hectares. This will increase rice production by 81% or 109,000 tons, amounting to an estimated monetary benefit of US$1.67 million, annually. In addition to irrigation of land, water from the Moragahakanda Reservoir generates 25-megawatt power at the Moragahakanda Hydroelectric Power Station. The Kalu Ganga irrigation scheme is a historic turning point of the country’s agricultural and irrigation development component, since the time of our great ancient kings. Once the Moragahakanda scheme is connected to the Kaluganga project, the water scarcity in North Central, Eastern and North Western areas including the North would be solved to a greater extent. It has been estimated that by 2019 under this Moragahakanda – Kaluganga irrigation project, an extent of 185,000 hectares would receive adequate water for cultivation both in the Yala and Maha seasons. Meanwhile, the construction work of the long awaited North Central Canal Project is being initiated simultaneously. Under the first phase of the NCP canal project, the upper Elahera canal, North Western canal Project and Minipe anicut rehabilitation will be initiated. Initially, the nine kilometre canal way channeling water from the Kaluganga reservoir to the Moragahakanda reservoir will be completed. The 65 km upper Elahera canal channeling water from Moragahakanda to Manankattiya and Mahakanadarawa in the Anuradhapura district will be the next to be constructed. Once this project is completed the people in the Kekirawa, Dambulla, Hingurakgoda, Elahera, Galenbindunwewa and Palugaswewa in Anuradhapura, Polonnaruwa and Matale Districts will benefit. Families who are living in Kaluganga Dam construction site were resettled about five kilometres away from their original homes at Guruwela resettlement area and compensations too were paid. The families affected under the Moragahakanda reservoir were provided new lands at the Thorapitiya resettlement area. The project has paid special attention to minimise the impact on the environment. The following activities are currently being implemented as stipulated as in Environmental Effect Assessment (EIA) Report. President Maithripala Sirisena said the implementation of the Moragahakanda-Kalu Ganga Irrigation Development Project is not only a fulfillment of a long awaited aspiration of the farmers but also a personal dream, come true for him. Another unique feature is, the Moragahakanda-Kaluganga scheme represents the spirit of cooperation prevailing in the government of consensus. While the massive projects hitherto were implemented by the governments of the UNP and SLFP separately, this the first major project implemented under the unity government of the two major national parties.